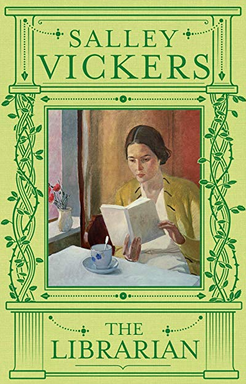 Despite its delightfully old-fashioned cover, The Librarian, by English author Salley Vickers, is a new release. It was lent to me by my friend Suzanne, who guessed correctly that its setting in rural Wiltshire in 1958, and its heroine, a young children's librarian, would appeal to me! This is a perfect summer holiday read. 24 year old Sylvia Blackwell has taken a post in a small country town, where she battles with the smarmy head librarian, gradually befriends her neighbours, and falls in love. She also butts up against the small-minded conservatism of post-war England. Rural Wiltshire is a place familiar to me, because my father's family come from there; in fact, Dad might have shared a London-Swindon train with Sylvia, just before he emigrated to Australia. And to add to the parallels, the novel ends with a coda in Melbourne, where two of the child characters meet up many years later and we discover what became of the rest of the cast. Principally, The Librarian celebrates the love of books, and especially children's books. 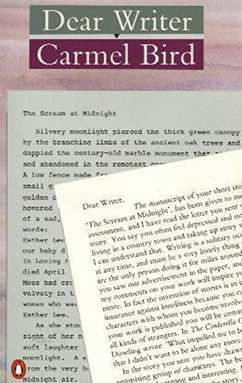 1958 was the year that one of my all-time favourite books, Tom's Midnight Garden, was published, and it duly receives a mention here, along with several other classics. Vickers also name-drops some authors I'm not familiar with, like Sylvia Townsend Warner, whom I will need to check out. Perfect for reading under the fan with a cool glass of elderflower cordial. Cheers! For a slim volume, Carmel Bird's Dear Writer packs in a huge amount of useful advice for a budding writer (or even, dare I say, a more experienced one). Bird has spent many years teaching and writing, and her wisdom is worth listening to. 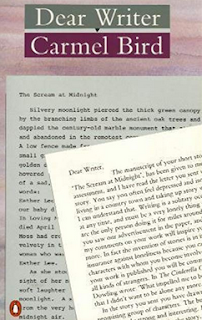 Though Dear Writer was first published in 1988 and some of its advice has dated (hints about how to post a neatly typed manuscript, for example), I see that a newer version came out in 2013. I suspect that most of the original content was preserved, because the advice in here is very solid. Well worth a read. Thank you to my friend Bridget for giving me Normal People for my birthday! It's SO GOOD. 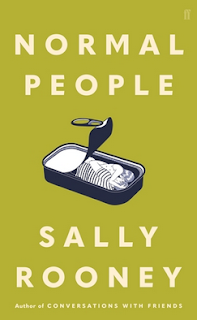 I can see why people are raving about Irish author Sally Rooney, whose previous novel, Conversations With Friends, has also been lauded (and which I also now urgently need to read). Normal People opens with Marianne and Connell in high school, in a small Irish town. Marianne comes from a wealthy but deeply unhappy family, and is shunned and bullied at school. Connell is the effortlessly popular, kind son of single mother Lorraine, who cleans Marianne's house. The two teenagers start a clandestine relationship, which has to be kept secret because association with Marianne will mean social death for Connell. Of course this painful situation results in tears all round. But the story is just beginning. Marianne and Connell reconnect at university in Dublin, where the tables are neatly turned. Now it's Marianne who is effortlessly popular and sought after, and Connell who feels like an awkward misfit. Their lives cross and recross, sometimes separate, and reconnect again, but they are never truly apart. I so wish I was capable of writing a book like this! It's the novel I was trying to write in my twenties, but I didn't know how. 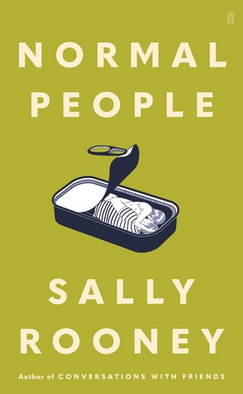 Sally Rooney is in her twenties, and she's nailed it. The pain, the misunderstandings, the delights of young adulthood are sharply and intelligently delineated in this cracking novel. I loved it. 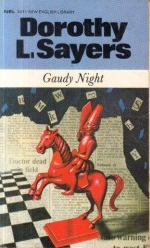 My all-time favourite Dorothy L Sayers mystery novel, I've been looking for a copy of Gaudy Night for absolutely ages and was thrilled to pounce on it recently at good old Brown & Bunting. I hadn't read this since high school and I quickly remembered why I'd loved it so much. Second, the romance. I love the fact that this is really Harriet Vane's book; Peter Wimsey doesn't even appear until halfway through. She takes the lead in the detecting, and we see her gradually falling in love with Peter in his absence, until the lightning bolt of realisation in the boat on the river (sigh). Both Harriet and Peter become truly rounded characters in this novel, and while Peter has become too perfect to be true, his perfection includes some weaknesses -- he is so sensitive, don't you know. Maybe I was expecting to find my own tall, fair haired Peter at university, too... oh, God! A most sinister retrospective ray of light has just fallen on an otherwise inexplicable relationship! Third, the philosophy. Central to the mystery, and the subject of many conversational and internal debates, is the question of how women are to reconcile the demands of work and family, career and caring, scholarly truth and personal needs. This book was written in 1935, and eighty-three years later, we are still wrestling with this dilemma. Lucky old Harriet, though tempted by academic seclusion, is able to have it all -- a loving and supportive partner who treats her as his intellectual and emotional equal, and who not only wants her to pursue her own work, but encourages her to a higher standard. Good on you, Wimsey. 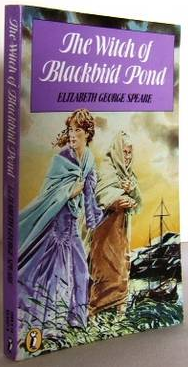 I was stunned to discover that Gaudy Night is disparaged in some quarters as a 'women's book' (huh!) and because there is no murder at the heart of the story, a deficiency that I hadn't even noticed until it was pointed out. For me, it's a most satisfying combination of mystery and relationship story. I'll be coming back to this one. Kate Saunders was moved to write this sequel to Edith Nesbit's Five Children and It when she realised that the boys of the family, Cyril and Robert, were exactly the right age to have fought in the Great War. Five Children on the Western Front is the story of a more grown-up, but still young, family of siblings, with the addition of two new members -- the Lamb (who was a baby when the first adventures occurred and is properly known as Hilary) and Edie, who wasn't yet born -- during the course of the First World War. It's these last two children who most welcome the return of the Psammead, an ancient sand-fairy who used to be able to grant wishes, but seems to have lost all his powers. I adored all E. Nesbit's books and I read Five Children and It many times. 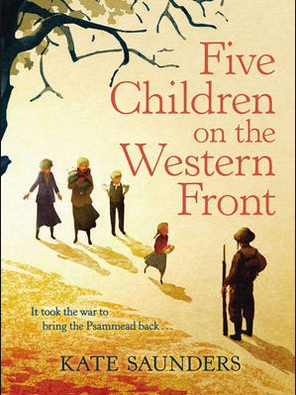 Five Children on the Western Front is a worthy successor, but I can't imagine there would be many contemporary children who are familiar with the original. I tried reading Five Children to my daughters when they were young; I forced them to sit through The Railway Children; I tried The Treasure-Seekers on them, too. But they just didn't take. Perhaps the gap between Nesbit's early 1900s world and mine of the 1970s was just about bridgeable; but the chasm of a hundred years was too wide. So perhaps the audience for this book is nostalgic adults like me. Like the Psammead itself, this book didn't quite recover the all the magic of the original stories. But it had just about enough to enchant me. Sweet and sad. After my great success with Jane Eyre, I actually splashed out and bought Murder Must Advertise on my phone for the princely sum of $0.99 (though apparently the author is one Dororty Sayers, the content appears to be the same). Sayers herself worked at an advertising agency, and the book is filled with the minute detail that only an insider would know -- the feuds between copywriters and the art department, the irritating clients who think they know best, the row of errand boys playing with yo-yos and catapults while they wait to be sent out on jobs. Peter Wimsey slots into this milieu as if he were born to the job, naturally. I think it's around this time that Sayers really began to fall in love with her own hero, because Wimsey is too good to be true. A brilliant mind, an exceptional cricketer (with the 'exceedingly characteristic late cut' quoted by Nicola Marlow in The Cricket Term) and also (urgh) at forty-five, mind you, diving from the tops of fountains in a harlequin outfit. Now that is where I draw the line, I'm afraid. 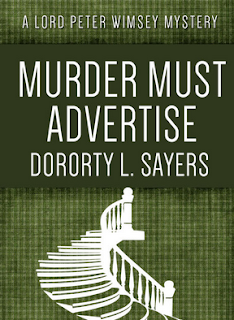 These quibbles aside, and the odd regrettable hint of casual racism, Murder Must Advertise is a great romp which I raced through much more quickly than I planned. Another classic that I had never read. It just so happened that the week I was reading The Witch of Blackbird Pond, the Doctor Who episode was The Witch Finders -- coincidence? I think not! It also happens that I'm reading another book, set two hundred years later than Elizabeth George Speare's novel, but which also features a ship called the Dolphin... well, okay, the Green Dolphin... but still, spooky enough! I don't know how I came to neglect The Witch of Blackbird Pond when I was younger. Maybe because it was American, and I tended to favour English stories? But I must say I thoroughly enjoyed it. Poor Kit, born in carefree Barbados (let's overlook the sticky slave-owning aspect of dear departed Grandpa) finds herself marooned in a settlement in Connecticut, surrounded by joyless Puritans and eligible young men. She befriends harmless Hannah, a Quaker, who is ostracised by the rest of the community, and Prudence, a down-trodden child, and manages to improve both their lives. Of course such charity cannot go unpunished! There have been a gazillion editions of this book since it first won the Newbery Medal in the 1950s, though I'm not sure how often it's read now. One small thing irritated me for a while, which was Hannah's habit of saying thee when she meant thou. I knew that Quakers used these informal pronouns (though paradoxically they sound more formal to a modern listener) to underscore their belief that all people are equal before God, but hearing Hannah say, Thee must go now grated on my ears. BUT Professor Google reassures me that indeed, Connecticut Quakers did use thee for both forms of address... so I guess I just have to wear it. Pilgrim at Tinker Creek was a present from my book group friend, Cathy, after I'd told her how much I enjoy nature writing (eg Robert Macfarlane). However, I admitted that I'd only really read English nature books, so she generously introduced me to this American take on the subject. 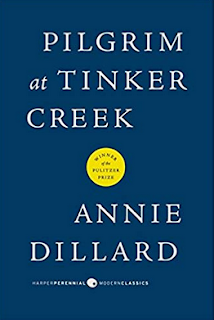 Annie Dillard won the Pulitzer Prize for Pilgrim in 1974; she was only 27 years old, and indeed, as she admits herself, the book does show the exuberance and boldness of youth, with all the strengths and faults that implies. I had to consume it one bite at a time, lest I become overwhelmed with the rich, showy extravagance of Dillard's writing. However, this extravagance is appropriate, because the author's project is to explore how the unnecessary, profligate exuberance of creation might reflect the magnificence of a Creator; and how the blind suffering and decay of the natural world is the essential dark side of that rich and teeming light. This is a deeply spiritual book cloaked in the guise of a nature study, struggling to make sense of a world at once so beautiful and so harrowing. Dillard traces a year at Tinker Creek, from the first stirrings of hopeful spring to the return of a clean, sparse winter. Her keen eye observes insects, ripples, the shrivel of a leaf, the horrific death of a frog, the secretive muskrat, the force of a flood. I really loved immersing myself in her world, and I wish I could find an Australian equivalent of this powerful, thoughtful, complex meditation on life and death. Thank you, Cathy, for introducing us.